Although there are several designs for a bird trap access door, the swing-out and sliding type of doors are perhaps the most common. A swing-out type (or sometimes called a "flip" type) of an access door is much easier to build than a sliding type. It has a simple design and is reliable. There are no precision parts to fabricate that may jam and render the access door inoperable. 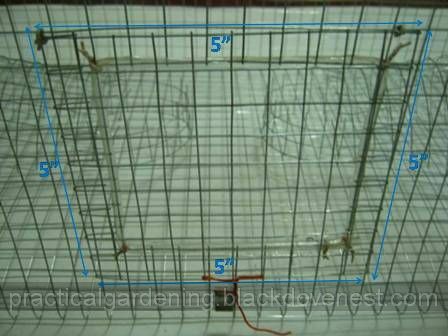 This DIY (Do-It-Yourself) project is for a simple yet effective bird trap, not a fancy bird cage to keep and feed pet birds. Even swinging doors have some variations. The common types are those that swing sideways (to the left or right) just like regular house doors. There are those that swing upward and those that swing downward. Unless the swing doors are spring-loaded, doors that swing upward are more preferred for traps that have trapped birds inside. In case you inadvertently release the door, gravity drops the door and temporarily closes a means of escape. A door that swings upward also means the opening starts at the bottom. There's a less likely chance that a bird will dive downward to escape. Cut a rectangular wire screen sheet that measures 5 inches high and 6 inches long. At both ends of the 6-inch length, fold the screen piece by half an inch. The length will now become 5 inches because of the two half-inch folds. So you now end up with a 5" x 5" square piece. The purpose of the folds is to make the sides of the access door more rigid. Here is the completed bird trap door showing the measurements. Attach the door to the access hole by making a couple of simple loop hinges. With a piece of thin insulated wire, create a loop that will loosely join the wire from the front panel and the access door together. Shown below is a loop hinge at the upper-left end of the access door as well as the half-inch fold created at the left side of the door. Make another loop hinge to fasten the other end of the access door. Shown below is the completed installed door with the two hinges and the half-inch folds. Adjust the loop hinges as necessary to ensure the bird trap door swings freely upward and downward. The door lock is made up of the tie wire that's attached to the bird trap door and an anchor that is attached to front panel of the housing. With a pair of tin snips, cut a piece of aluminum strip that is 1 3/4" long and 1/2" wide. This will become the door lock anchor. With a pair of pliers, form a letter "Z" with the aluminum strip. The top horizontal bar of the "Z" is 1/2" long. The diagonal part is 3/4" long and the bottom horizontal bar is "1/2" long. Bend the bottom part of the strip further until it forms an opened loop. This is how it will appear when the lock anchor is installed on the front panel. Below is the lock anchor showing the top bend and the bottom closed loop. Hook the top bend of the anchor on a wire on the front panel just below the bird trap door. Hook the bottom bend of the anchor on a wire below the first wire (where the top bend was hooked). Close this bottom bend into a closed loop. The anchor should now be fixed on the front panel. Cut a piece of thin insulated wire that is 6 inches long. This wire will become the lock tie. Tie the insulated wire to two squares at the bottom of the bird trap access door. Let the rest of the lock tie dangle. To lock the bird trap door, coil the dangling lock tie to the lock anchor as shown below. Now you might think the door looks flimsy. Well, unless the small bird is on steroids, I seriously doubt he'll manage to shove the door open.